Thanks in large part to the internet and social media, essential oils are becoming a household name. What many people don’t know, however, is that essential oils are able to treat high blood pressure. There is no doubt that a lot of people like the smell of essential oils. In addition, there are tons of reports of people experiencing health benefits as a result of the oils. Perhaps you have heard of people using peppermint oil for stomach aches, eucalyptus oil for a stuffy nose, or tea tree oil for scrapes and minor cuts. But have you heard of essential oils for high blood pressure? When applied to the skin, essential oils penetrate into the cells and get absorbed by our body. Once inside, people report that they have experienced everything from natural healing to a growth of new cells. Essentials oils can also be inhaled, so they can be great in sprays and candles. When it comes to high blood pressure, the essential oils seem to gradually dilate the arteries, reducing emotional stress. They also act as an antioxidant to decrease oxidative stress. There are many potential contributing factors to high blood pressure. Obesity, a sedentary lifestyle, emotional stress, a high salt diet, smoking, high caffeine intake, and high alcohol intake are all contributors. If you are diagnosed with high blood pressure, you might be prescribed medication to help get your blood pressure back to a “normal” or acceptable level. However, natural essential oils can also be helpful. 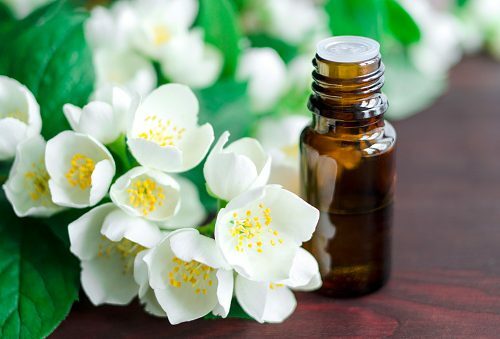 Jasmine oil – known to improve breathing and eliminate anxiety, having a soothing impact on the nervous system which can help with blood pressure. Geranium oil – helps improve blood circulation and balance emotions. Lavender oil – the aroma is said to provide a “positive energy,” helping reduce blood pressure. Marjoram oil – the most popular oil in terms of dilating arteries. Known to have a very calming effect on your mind. Rose oil – enriched with anti-inflammatory properties and the ability to increase blood circulation, making it an option for hypertension. Lemon oil – known for its effectiveness as an anti-anxiety treatment, making it a possible treatment for anyone who has stress related high blood pressure. Valerian oil root – considered a powerful nerve-relaxer that helps with tension, insomnia, shock, and heart palpitations. Some people who suffer from disturbed sleep due to high blood pressure have found it effective. Melissa (lemon balm) oil – this contains anti-depressant properties. Some say it acts as a tonic, reducing high blood pressure and preventing heart palpitations. Mandarin oil – has the ability to calm the nervous system and has a cooling, refreshing effect so blood vessels won’t get constricted. Vetiver oil – this oil is known as an overall body-calmer. It has a reputation for being a good sleep aid. Ylang Ylang oil – this is an oil that many people report relaxes their mind and body. It has been touted as a reducer for rapid heart rate and a way to help decrease high blood pressure. Yarrow oil – one of the best essential oils for improving blood circulation. Many people experience improved blood pressure when their blood circulation improves. Neroli oil – this oil has anti-depressant properties, helping your nervous system. Bergamot oil – research shows that when this oil is inhaled, neurotransmitters are released, creating a feeling of well-being that can lower blood pressure. It also can reduce food impulses. Clary Sage oil – studies indicate that clary sage oil reduces stress and has anti-depressant effects. Frankincense oil – this is considered a powerful essential oil with a calming impact. It can reduce stress and regulate the heart, making it a potential high blood pressure prescription. Approximately 75 million adults in the United States are suffering from high blood pressure – that’s one of every three adults. The Center for Disease Control and Prevention reports that only about half of those with high blood pressure have the condition under control. Those who are trying to fight high blood pressure are often looking for ways to address the problem naturally. While medical intervention is crucial with high blood pressure, many people have said that they have experienced surprising results with incorporating essential oils into their treatment. Most people have to experiment a little before they become comfortable using essential oils. There are different ways to use the oils for blood pressure, so you might want to try each method to see which you like best. Some people use recipes that call for a combination of oils for high blood pressure to create a balm. The balm is then rubbed into your temples or under your nose, and it’ll clear your mind of stress or anxiety. Others prefer the diffuser method, which often involves mixing equal parts of different essential oils and putting them into an aromatherapy diffuser. You then slowly inhale the oils for anywhere from 15 to 30 minutes. The majority of people seem to like the massage approach. This simply means taking several drops of the oil or a mixture of oils from a recipe and creating a relaxing massage oil. You can also add the oil to a warm bath and soak for at least 20 minutes. Shake 20 drops of marjoram oil, 10 drops of ylang-ylang oil, 10 drops of mandarin oil, and 5 drops of lavender oil in a small glass dropper bottle. Mix 6 drops of clary sage oil, 6 drops of marjoram oil, 5 drops of lavender oil, and 30ml of sweet almond oil (carrier oil) in a glass bottle. Place 1 drop of sandalwood oil, 2 drops of lavender oil, and 2 drops of geranium oil in a warm bath. Combine 5 drops of lavender oil, 5 drops of clary sage oil, 5 drops of frankincense oil, and 2 drops of coconut oil (carrier oil) and apply it on your temple or on your nose. Mix 15 drops of frankincense oil, 15 drops of rosemary oil, 15 drops of marjoram oil, 15 drops of cypress oil, 30 drops of ylang-ylang oil, and 1 ounce of Simple Salve. When the salve melts, add the essential oil mix and let it sit overnight to consolidate. You can then rub it on the soles of your feet, on your hands, and near your heart. Put 2 drops of bergamot oil, 2 drops of lavender oil, and 2 drops of ylang-ylang oil in your diffuser and inhale for 15–30 minutes. Essential oils are not a complete health solution; however, they can be an important part of your overall well-being. Learning to incorporate essential oils into your daily routine, along with physical activity, a heart healthy diet, and ways to decrease stress can be a natural way to keep your blood pressure in line.